Maintaining a birdbath is a practice normally done by wildlife lovers who want to attract birds to the landscape, so it only makes sense to make every effort to keep that birdbath as attractive and healthful to the birds as you can. There is much more required than simply topping off the birdbath with additional water when it gets low. 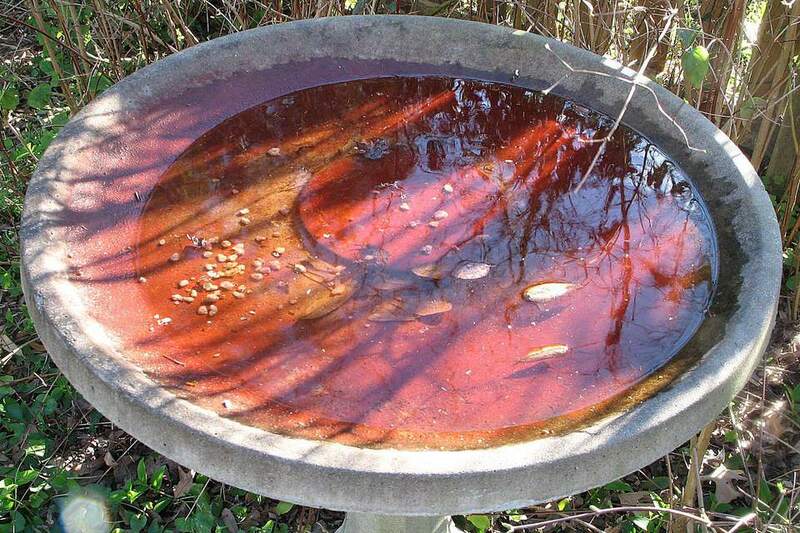 A dirty birdbath is not only unattractive to birds, but it can cause health problems for the birds and even for people. No one wants to drink dirty, polluted water, including birds, but clean water is more important than just for taste. Dirty water can spread different diseases to flocks of backyard birds, and it encourages gnat, mosquito and other insect populations that can, in turn, infect humans and other animals. Dirty water can have odors that may attract other pests, and algae and dirt accumulation can stain a birdbath so badly that it can never be restored to its original beauty. Clean water, on the other hand, is more attractive to the birds, safer for all wildlife, and will bring a wider variety of birds to your yard. The frequency with which you clean a birdbath depends on many factors, including the weather, the quality of your water, the location of the birdbath, and the number of birds using it. The best advice is to clean the birdbath 2 or 3 times a week, or whenever you begin to see discoloration of the water or on the bottom of the birdbath basin. At certain times of year—during the hot months of summer or the fall when leaves are falling into the birdbath, for example—you may find it necessary to clean more often. Cleaning a bird bath is not difficult if you have the proper tools to keep the bath sparkling and take the time to be sure it is thoroughly cleaned. This water can be dumped on the grass or nearby flowerbeds, but should not be allowed to puddle where birds can use it before it evaporates. Remove loose material from the bottom of the birdbath. Use a disposable rag or a scrub brush to remove any large deposits of spilled seed, feces, debris, and other contaminants. The pressure attachment of a hose can also be effective, but be mindful about wasting water. Create a bleach solution made from 1 part chlorine bleach mixed with 9 parts water. If your birdbath is positioned within garden plantings or on the lawn, remove the basin and wash it in a spot where the bleach will not strike plants or grass. Scrub the basin, lip, and any areas of the birdbath where birds land, perch, drink or bathe. For extremely dirty birdbaths, it may be necessary to allow the bleach solution to soak for several minutes. While soaking, monitor or securely cover the birdbath to make sure no birds approach the bleach-filled water. After washing, rinse the birdbath thoroughly with running water until there is no persistent chemical foaming. A very slight chlorine smell may remain, but it should not be a strong or pungent odor (it should not smell as strong as a public pool, for example). Once rinsed, allow the birdbath to dry fully in bright sunlight, which will break down any remaining chlorine so it does not contaminate the refilled water. This is a good opportunity to clean the area around the birdbath, refill feeders or do other bird-related chores. ﻿Use fresh, clean water, ensuring the basin is balanced and stable so it will not spill. Your birdbath is now fresh and clean, ready for songbirds to fill your yard with their activity. The easiest way to clean a bird bath is to ensure it doesn’t get dirty. While all baths will eventually need to be cleaned, there are steps that can minimize the need for more frequent cleanings. When refilling the bath, always dump out old, stagnant water instead of just adding more to the basin. Rinse the bath briefly with a pressure hose at every refill to remove sticky debris and feces. Position the bath away from feeders so spilled seed or hulls will not land in the water. Keep the bath out of the reach of pets and do not allow children to play with the water. Choose a shady spot for the bath to minimize algae growth and slow the rate of evaporation. Position the bath where it will not be clogged by grass clippings, falling leaves, and other debris. Keep the bird bath full to avoid concentrating pollutants in smaller amounts of water. Add a copper source to the water to inhibit algae and keep the bath cleaner.